Brighton exited the Carabao Cup at the hands of Southampton last night, with Charlie Austin’s late header sending the Saints through. Despite the loss, Chris Hughton said he was delighted with the performance from his team, which contained a number of youngsters from the under-23 side. It is hard to look too much into the defeat as both sides made ten changes from the weekend but Albion will want to move on as soon as possible as they prepare to take on Fulham in the Premier League this weekend. Albion had five players missing through injury last night, which resulted in three members of the under-23 squad starting and one coming off the bench. Bruno, Lewis Dunk, Jose Izquierdo and Florin Andone were all ruled out and under-23 defender Ben White - who probably would have started - was injured last week. 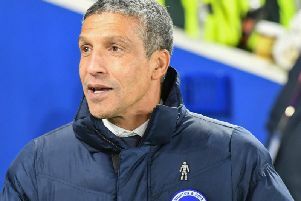 Albion boss Chris Hughton said afterwards that Southampton have a better squad depth than the Seagulls at the moment, which showed with their own team selection. The Brighton starting line-up had made a total of 88 Premier League appearances between them, while Southampton's starting 11 had played 842 times in the top flight. Saints were also able to send on Nathan Redmond and Charlie Austin off the bench. They have made 224 Premier League appearances between them - and Redmond crossed for Austin to score the only goal. The Amex was three minutes away from its first ever penalty shootout until Charlie Austin’s late header put Southampton ahead. Cup games have gone to extra-time before in the Amex era - most notably in the victory over Sunderland in the stadium’s debut year - but penalties have yet to feature. There would have been no extra-time last night, with a change in the cup's rules stating matches go straight to penalties after 90 minutes. First team debuts were handed to Viktor Gyokeres, Ben Barclay and Will Collar and they performed admirably against Premier League opposition. Gyokeres was a constant threat and was unlucky not to head Albion into the lead in the second half, with Angus Gunn producing a fine save to deny the Swedish youngster. Barclay and Collar managed to contain the Southampton attacking force of Manolo Gabbiadini and Mohamed Elyounoussi, before they were undone by tricky winger Nathan Redmond and Charlie Austin’s header. All three earned the praise of Chris Hughton afterwards, with Albion's boss saying he was delighted with their performances. Yves Bissouma was Albion’s stand-out player at the Amex last night. He was excellent at keeping the ball in tight situations, almost as if it was glued to his feet. He unleashed a venomous strike in the first half after skipping between two defenders, but the shot sailed over. After also starting at Liverpool on Saturday, he is pushing for a regular place in the starting line-up. Southampton’s Premier League quality prevailed as they eventually broke down Albion’s inexperienced defence late on. Having brought on Nathan Redmond and proven Premier League goalscorer Charlie Austin, the Saints used their top-flight experience to graft out a victory. With players like Alireza Jahanbakhsh still not fully up to speed, the game was an opportunity to get more minutes under their belts. Albion will hope the Iranian winger begins to deliver as he gets more game time. With no distractions now until January, Albion can turn their full attention to another survival fight, starting with Fulham on Saturday. The Seagulls will hope the cup competition can prove to be a distraction for other sides around them - as shown by Burnley's Premier League form owing to their Europa Cup exploits. A two-week break after the match with Fulham also gives Albion a chance to try to get some of the injured players back fit for when they travel to Southampton on September 17.